Piezo-positioning mechanisms are often used in high-precision positioning applications. Due to their materials, nonlinear hysteretic behavior is commonly observed in such mechanisms and can be described by a LuGre model. 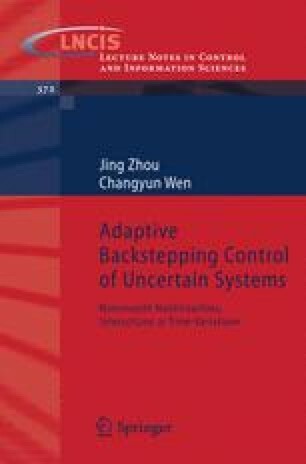 In this chapter, we develop two robust adaptive backstepping control algorithms for piezo-positioning mechanisms. In the first scheme, we take the structure of the LuGre model into account in the controller design, if the parameters of the model are known. A nonlinear observer is designed to estimate the hysteresis force. In the second scheme, there is no apriori information required from these parameters and thus they can be allowed totally uncertain. In this case, the LuGre model is divided into two parts. While the unknown parameters of one part is incorporated with unknown system parameters for estimation, the effect of the other part is treated as a bounded disturbance. An update law is used to estimate the bound involving this partial hysteresis effect and the external load. For both schemes, it is shown that not only stability is guaranteed by the proposed controller, but also both transient and asymptotic performances are quantified as explicit functions of the design parameters so that designers can tune the design parameters in an explicit way to obtain the required closed loop behavior.